Our program has more features for one low price than any other Text Message Marketing program on the planet! All other text message marketing services sell you a limited service for their low price then charge you more for extra features. Not eTEXTco! We give you all of the same features every other company provides and even more features, all for one low price, no upsells! eTEXTco has the lowest priced service in the industry. $49 monthly, all inclusive. Social Marketing is HUGE! Join the revolution today and see why text message marketing is the most effective and least expensive marketing ever. All services include access to ALL of the modules below - no hidden or extra charges! provide an exciting and effective marketing platform. 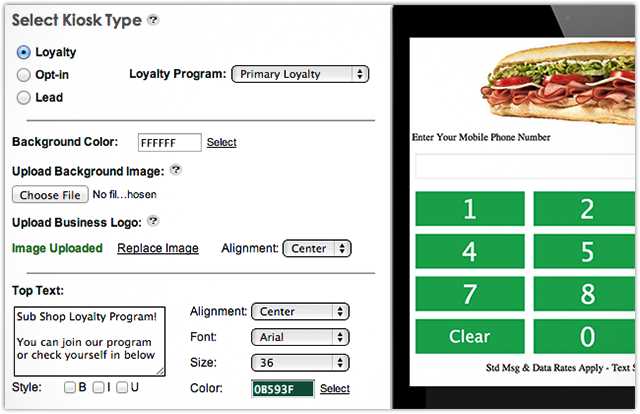 Create virtual punch cards with The Loyalty Program! Loyalty cards have always been a very popular customer rewards tool. The one downfall is that they are constantly being misplaced or lost. With our Loyalty tool all you need is a mobile phone number and you can have your card punched at the time of purchase. It is important for business owners to implement programs that not only continue to drive customers in but also make them feel appreciated, especially in tough economic times. Spread the word! Tweet your offers and text messages for your followers to retweet. Motivate mobile users to opt in on your fan page! Simply follow our guide and with the help of a free application like MyTab, paste our iframe code into your page to create the page quickly and easily!! When sending out a message, coupon offer, or mobile webpage, you have the convenience of putting it immediately on your Facebook wall! Kiosks are a great way to engage customers. Your customers can use them to opt-in to an sms list and start receiving offers and updates or “punch” their virtual loyalty card and earn points with every purchase towards a prize. When a user provides us with their email address, our system will automatically relay that information to your email marketing platform. Create beautiful and rich mobile pages with full customization options based on your custom graphics, colors and fonts. Your creative and marketing talent is 100% in control. 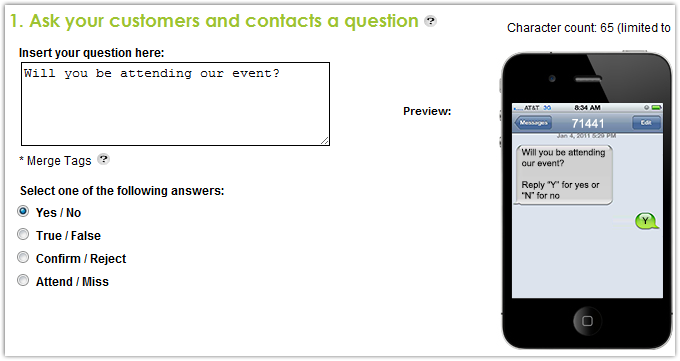 Run a mobile poll for live events and other business needs. Get fast, hands-on feedback from your customer base. Consult your bread and butter on decisions which can affect your business! 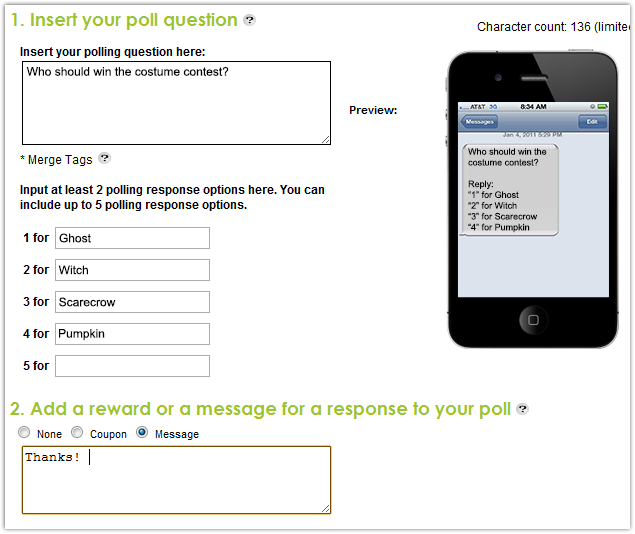 Polls are easy to create and consumers enjoy participating. Use a poll to help your business. Ask questions to be answered by users on your opt-in list. Questions engage the user and allow them to give you a tally of people attending an event, a quick opinion on something, etc. Everyone loves their birthday. Show your clients you care with a gift on their special day. 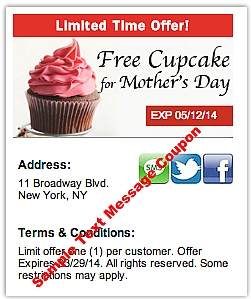 Add a coupon that can be included in your birthday message to excite your customer and continue to get their support because of your kind gesture. 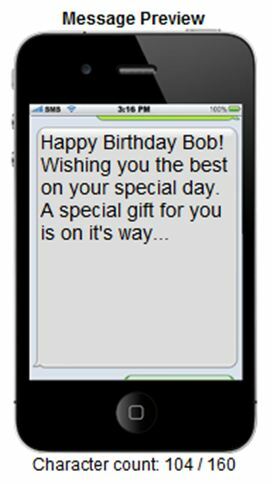 “Birthday Wishes” is an SMS marketing tool that allows businesses to market and engage with their customers prior to or on the day of their birthday. 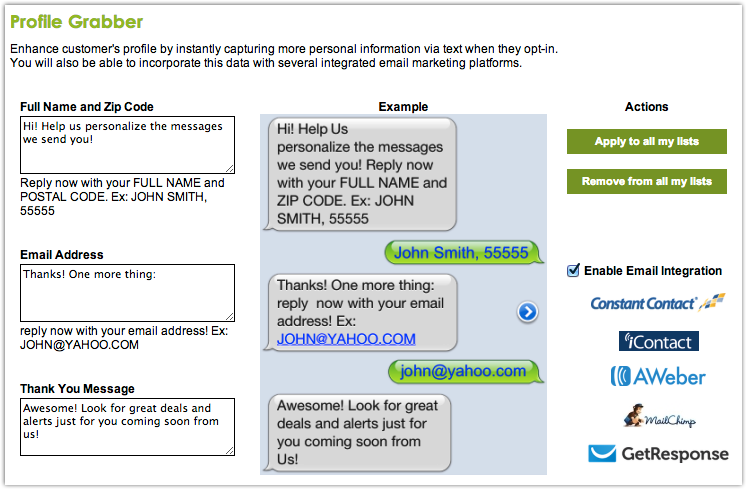 This tool will automatically wish your customers a happy birthday on behalf of your business, via SMS. Build a scheduled release of materials to customers in your opt-in list. Auto-responders add in the possibility of producing timed campaigns that routinely galvanize customers with evenly spaced increments of offers and text updates. From the day that the user opts in, their auto-response messages will come in the same lengths of time that any other user who has opted in. This creates an organized flow or “drip” of information. The drip could be an exercise program, daily tips or advice, anything you want! Display your live message stream on your own application, server, or website with our Text To Screen API. The message stream could be used in a variety of creative and intuitive ways such as a scrolling ticker or even a full screen overlay while an image or video is displayed in the background. This weapon in your marketing arsenal gives you the agency to create sweepstakes for your Opt-in and Lead generation lists. Assign a contest to a complete list, or limit entrants by offering it only to participants that text within a specific time-frame. Say you want to run a sweepstakes between two dates and times. Our ‘selective participants’ option allows you to include users who opted in within these specified times only. This creates an ‘act now’ mentality which motivates the user to text in immediately after learning of the contest. The contest runs when you create and save, or at a scheduled time. 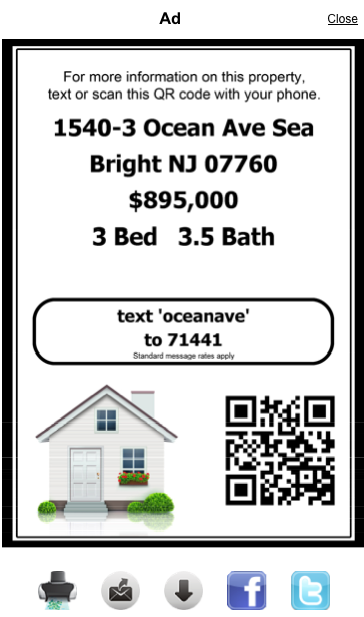 QR Codes are promising and creative. The many uses for them are still being discovered! It’s time to leap into the future with this new and exciting approach! Create QR codes in a flash using our QR Code generator. 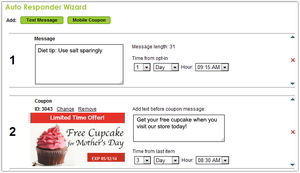 Enter your information and the wizard will create a unique QR code that can be printed, emailed or downloaded for future use. Direct the user to a website of your choice. The user scans the code and is instantly referred to the specified URL. This is a very straightforward way to drive traffic to your site and get the user to connect with your materials. Generating Real Estate leads has never been easier. Real estate has always been a very competitive market, and agents need every tool available to them to increase their pool of buyers. 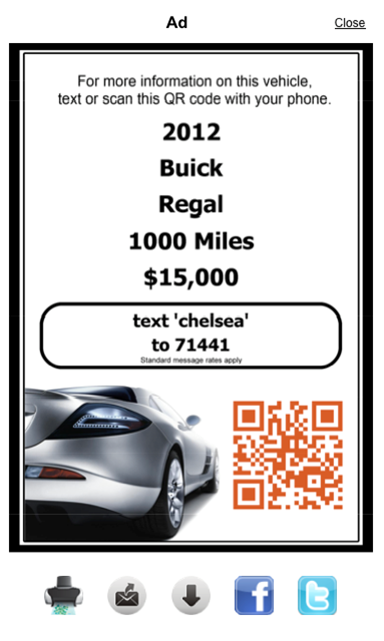 Keywords and QR codes can be added to sign riders as well as all print advertising. When a prospect requests information they will get a link to a landing page or a mobile website with pictures and info on the property and the agent will get a sales lead.